In general, healthy birds have a shiny and smooth plumage with no defects. For serveral reasons there can be changes over time. Some changes are natural like the moult which occurs at least once a year. Especially older pet birds often look a bit tousled while they're moulting. But normally the moult is no strain for a healthy bird. 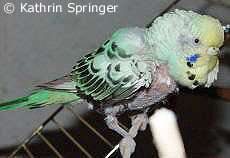 However, there are some plumage defects and diseases that can dramatically change the feathers and their structure. And some birds even tend to pluck their own feathers due to different reasons. Bird owners now how to recognize each kind of plumage abnormality or a disease affecting the feathers in an early stage in order to handle upcoming problems immediately. The sooner you take action the better the situation is for your bird. But please be aware that there are some diseases that affect the bird's plumage which cannot be healed. You will learn more about these diseases in this sub-category of Birds Online. 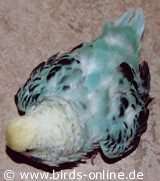 And of course you can find information here that will help you to determine whether your bird shows a normal moult or not. And you can find background information on a possible danger of infection regarding some diseases that affect the bird's plumage. Last but not least there is a chapter about feather-plucking. This behaviour should always be taken very serious to prevent further problems such as self-mutilation in the future.